This quilt, like the Skull Baby Toy that my daughter made, is for Noah and his wife's soon to be born baby. Ever since I made this Free-form Embroidery Skull, I've been enjoying playing with this technique whenever it fits the project. This is the largest baby quilt that I've made. 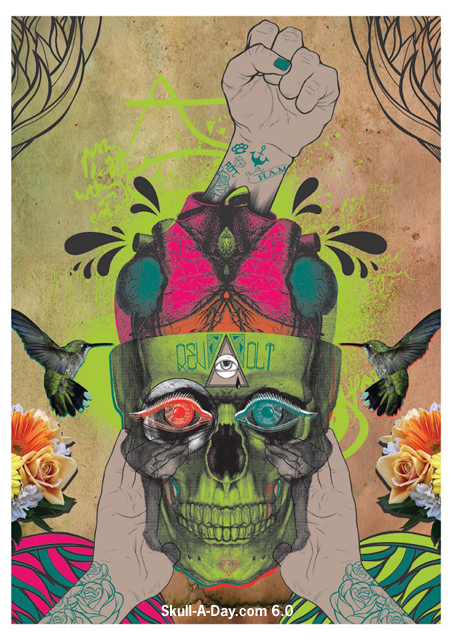 If you are familiar with my artwork, you might recognize this type of image...a skull with many flowers. It's Dia de los Muertos inspired. Since the gender of the baby won't be revealed until it's born, I tried to tone down the design. Though this quilt is for the blanket, Noah immediately said he might use it more. For scale of the quilt, Noah is holding it up in the photo. It's about a yard of fabric. 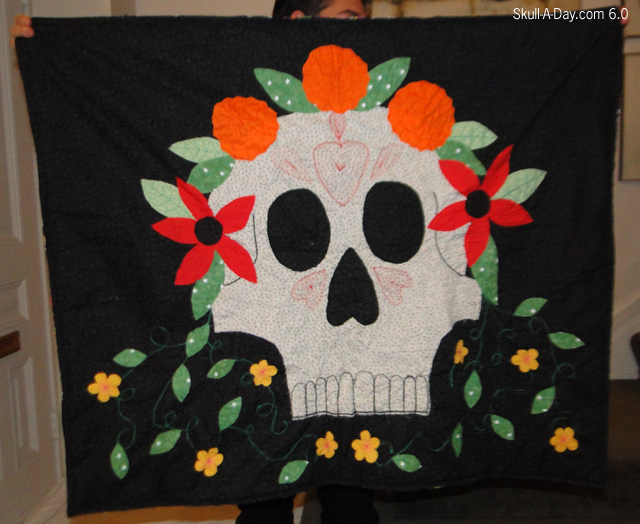 It's backed with this Dia de los Muertos printed fabric by Alexander Henry. This quilt took about 12 hrs to make. Well worth the time. I'm looking forward to meet the little baby the quilt is for. On Thursdays in the 6.0 year, I will post my own Dia de la Abby creations. On Thursdays in the 4.0 and 5.0 years, I posted my Dia de la Abby creations and occasionally tutorials with instructions on how I made my pieces. Hopefully you feel inspired by my posts just as I was by Noah's Skull-A-Day 1.0 daily project. Want to find me elsewhere, follow me on Facebook, my Blog, Google+ and/or Twitter. 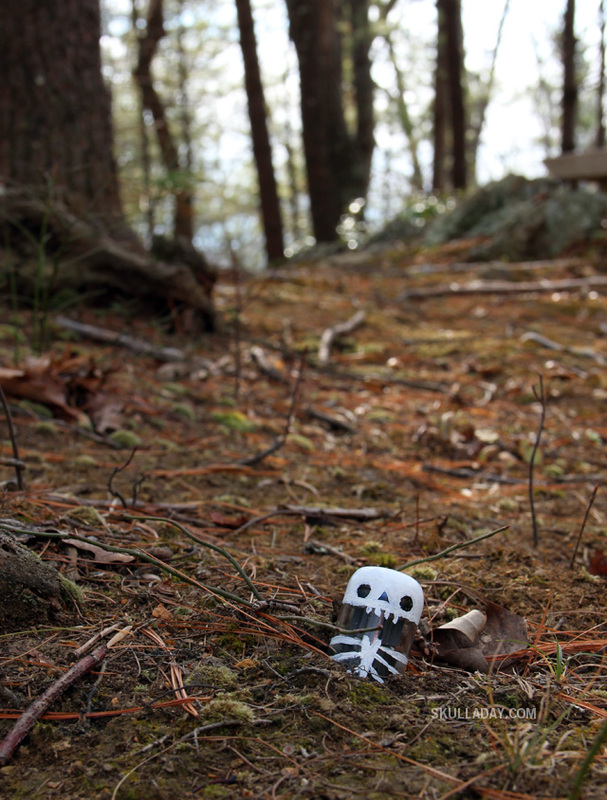 This skull toy is a gift made for a special baby by Alex Davis. You might recognize who is holding it, as Noah Scalin. You may or may not know, that Noah and his wife are expecting a baby in a few months. Of course that means that the baby gets gifts that their parents would like too. While I was busy making something (which you will see later today), my daughter was busy making a skull toy for the baby. This was totally her idea. She wanted to contribute to the baby gifts. She raided my fleece fabric stash (which exists to make baby gifts) to make the toy. She made the pattern, cut everything out, and stitched the face on. 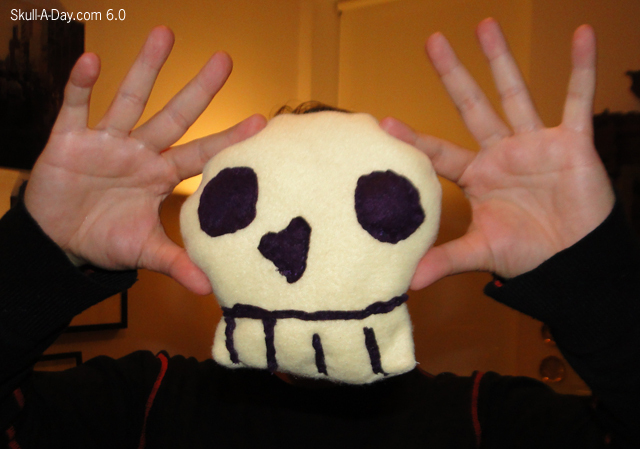 For baby safety, I stitched around the perimeter of the skull with my sewing machine, stuffed it, and closed it. I also re-enforced Alex's stitching on the teeth. She loves making toys and this is her best one yet. 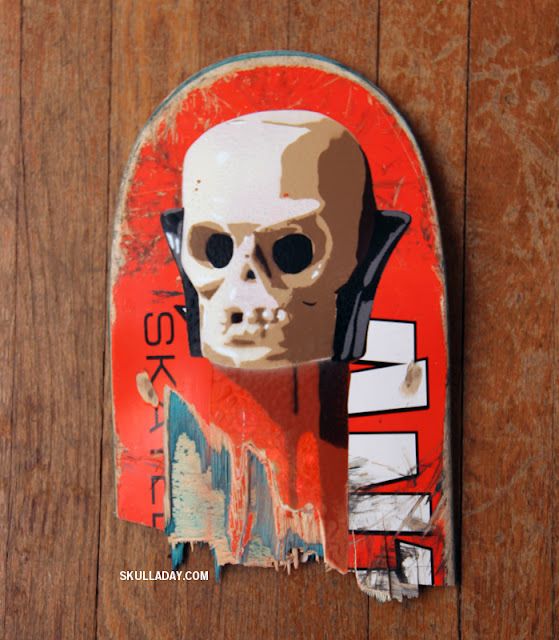 Have you made an awesome piece of skull art? If so, submit it to us! We love see what you all create, and might post it on our website. Details on what we need for a submission can be found here. Paul's Boutique in the UK has released a new bag that features my Skulledelic art! You can get your own HERE. THIS CONTEST IS CLOSED! Thank you for participating. 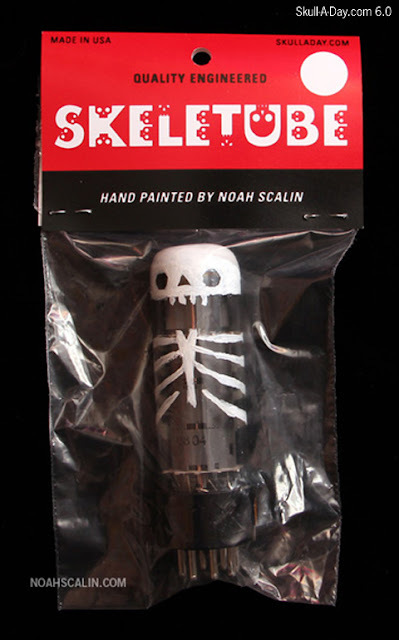 Don't forget you have until 11:59pm Eastern USA Time on Friday, February 1, 2013 to make an entry comment to win a Skeletube from Noah Scalin. You can find the original contest post by clicking the side bar ad, or this link. 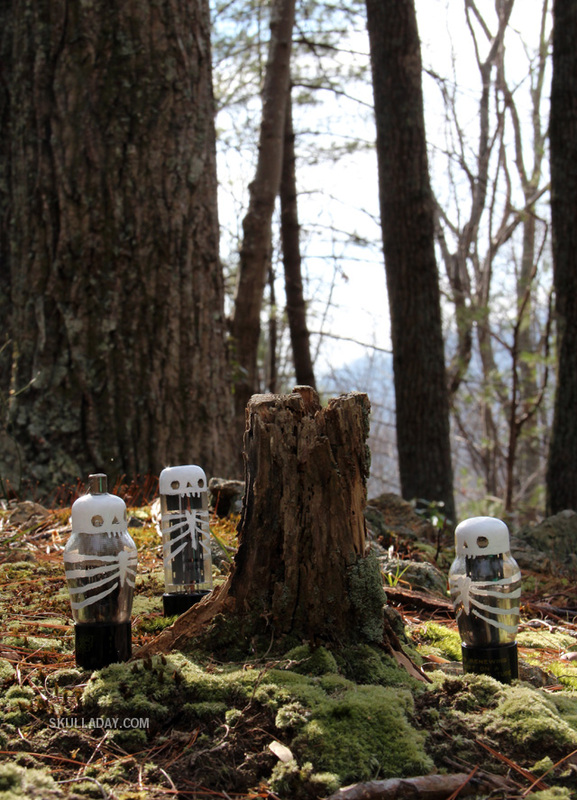 If you don't win, you can find these hand painted little guys in various models in Noah's Skeletube Shop. Like the chief of a demonic tribe this "Warrior Of Fate" commands attention and demands your soul! Todd Holtz used a combination of airbrush and digital art in creating this magnificent beast that would render any mortal man paralyzed with fear. I almost want to equate this to some sort of Native American/Predator alien kind of collaboration, but I don't think that would be exact, nor do I want to diminish Todd's endeavor to be unique. 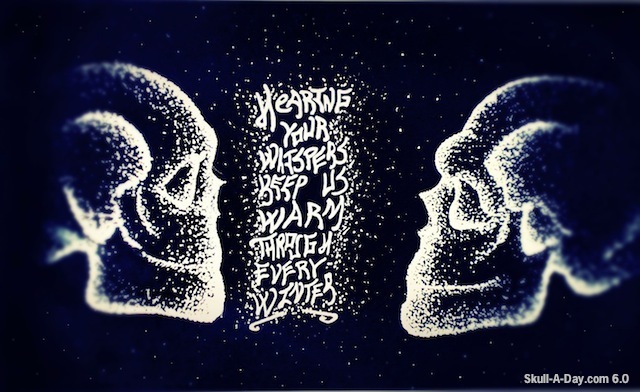 I love seeing the dark side skulls come out to the light. Thanks for sharing yours, Todd! Noah Scalin is of course the creator of Skull-A-Day. 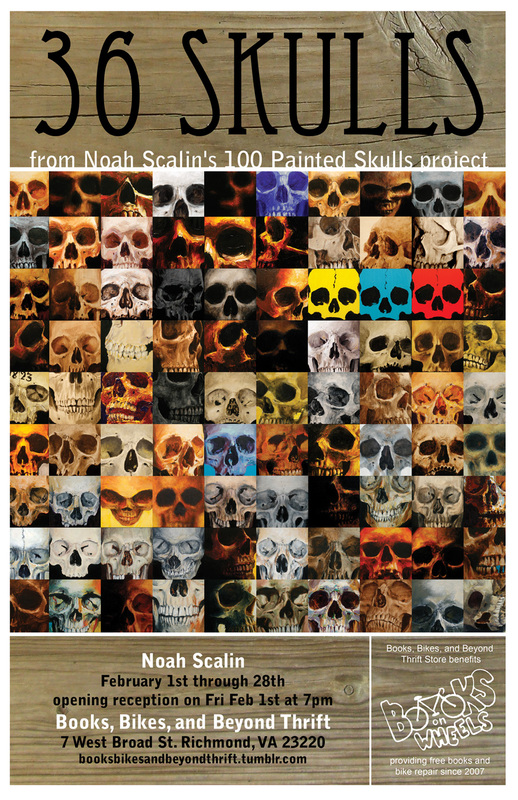 He's made hundreds of different skulls with various mediums over the years (366 in the 1st year of the project). Last year, Noah combined his love for skeletons and vacuum tubes, to create Skeletubes. 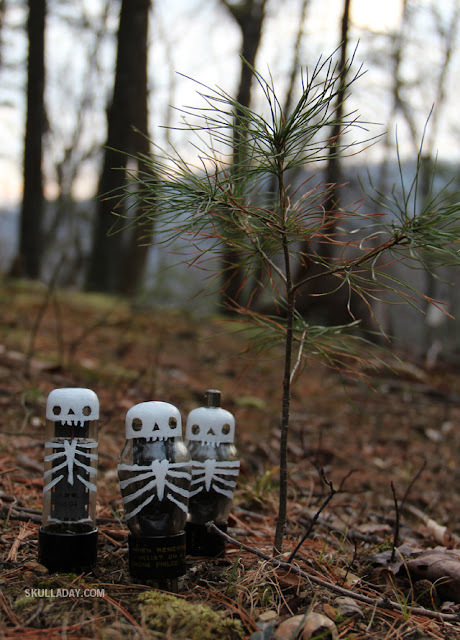 He's painted so many of these little guys that he's made a Skeletube army. Since so many people love these fun creations, Noah is giving away one Skeletube to one lucky Skull-A-Day fan! 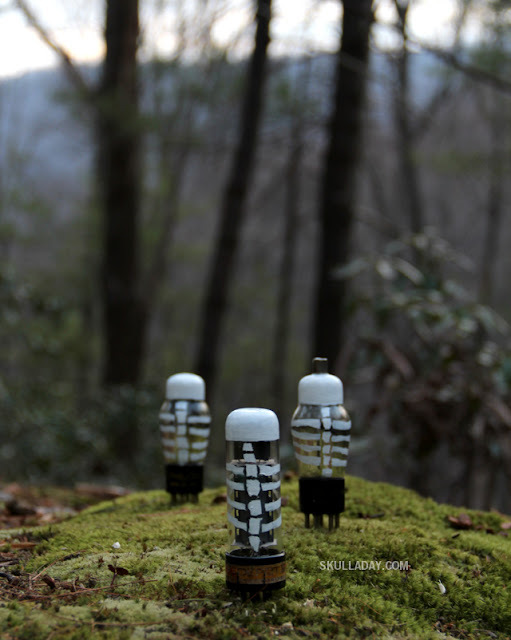 Occasionally these little guys like to get together and go on adventures. 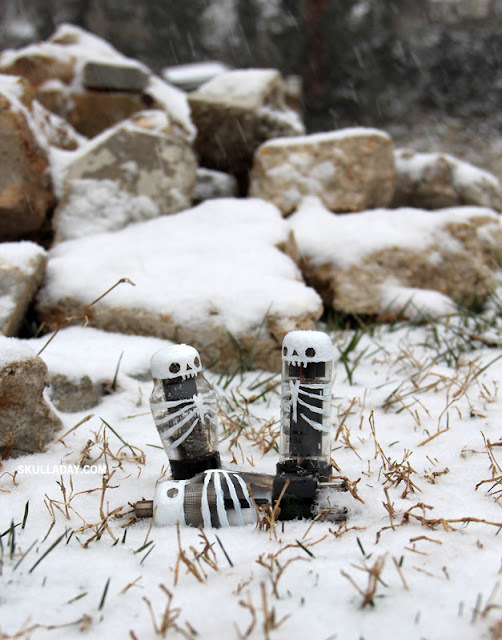 So far they've escaped to a mountain and had a snow day. 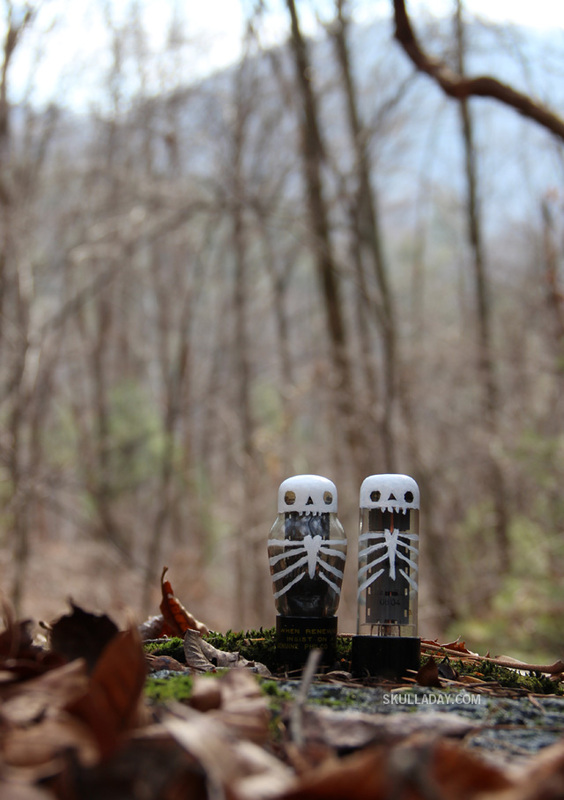 PRIZE INFO: One Model B bagged and tagged Skeletube. It is a hand painted skeleton vacuum tube that is packaged as shown. 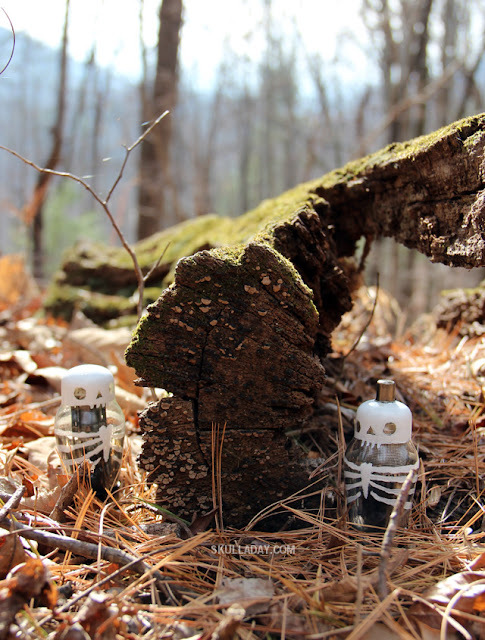 HOW TO ENTER: Leave a comment below telling us what adventures your skeletube would have if you had one? For example, I might take mine to the beach to dig for lost treasure or to a cemetery to find old friends. CONTACT INFO: If you win, we need to contact you. With your comment, please INCLUDE YOUR EMAIL ADDRESS!!! Entries are only valid with this information. CONTEST CLOSES: 11:59:59 PM Eastern USA Time Friday, February 1, 2012. IF YOU DON'T WIN: Don't fret. These hand painted little guys are available in various models in Noah's Skeletube Shop. I was recently offered a chance to create a temporary mural installation in the Loo Gallery at the wonderful Lamplighter Roasting Company here in Richmond, Virginia. The Loo Gallery is actually their bathroom and each installation is painted over when the next artist creates their piece! I decided to create a new wallpaper damask style pattern using only the bones of the human skeleton. I had previously created a smaller wallpaper pattern as part of my original Skull-A-Day project, but I had never done something so complex. Since the end result was so large and complicated it required two 18" x 24" stencils to create one complete section of the pattern. I had my friends at BIG SECRET laser cut two sets of the stencils out of thick, flexible mylar and I worked with them in rotation, since they would quickly start dripping from the layers and layers of metallic spray paint I was putting on them. 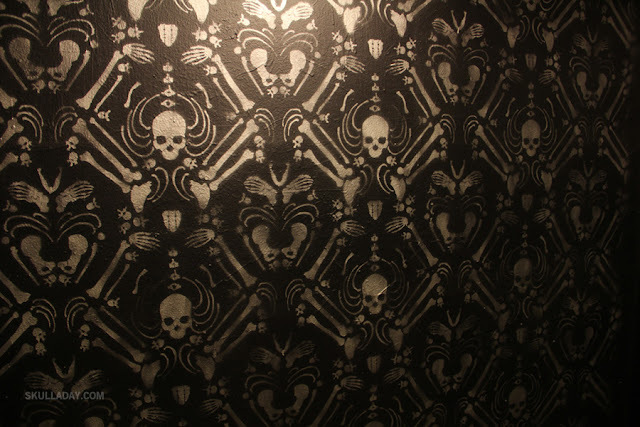 And who knows, maybe this will get turned into actual wallpaper one day, like my Ornamental Skull wallpaper at Designer Wall Coverings & Fabrics. In the meantime you can download a PDF to make your own stencil HERE. You'll need to make two copies of it and flip and reverse one to get the full repeat. It's available under a Creative Commons license, so use it for any personal project you like, just don't sell the stencil or the results for profit. And of course if you do use, please share a picture of the result! 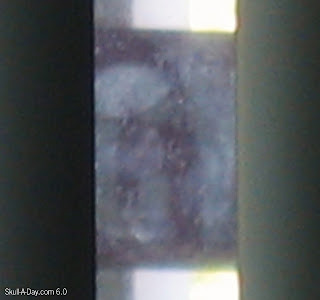 Rachel LeCount said "The picture is actually a combination of hand and nose smudges on our patio window with the vertical blinds and red sign in the background that framed the skull." What a wonderful combo that is! If you are having trouble making it out in the large image above, look at this small image. 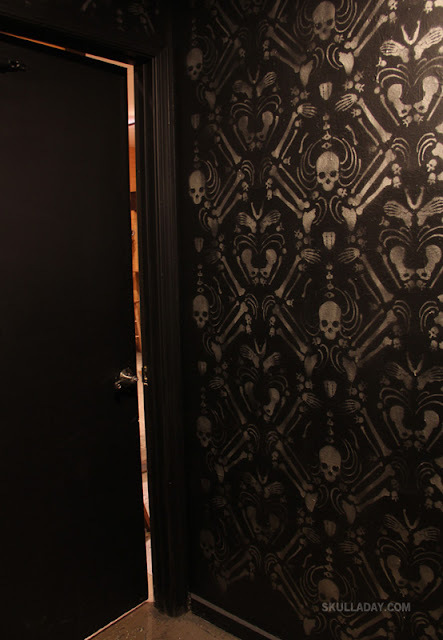 It condenses what you are seeing, so the skull pops out better. Keep sending those pictures in, we always love seeing what our skull hunters find. 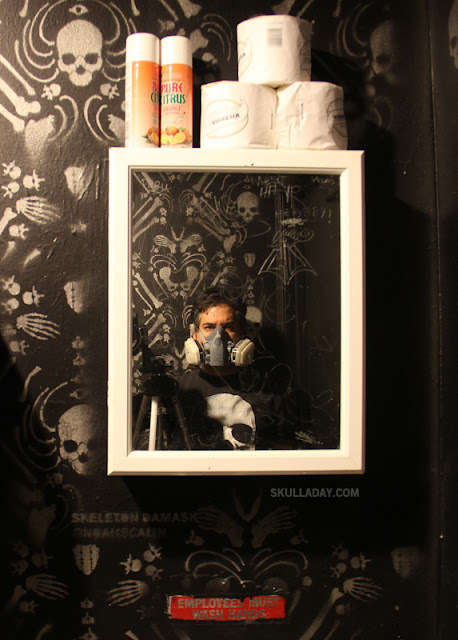 Anyone is welcomed to participate, it's fun and it's easy- if you see a simulacra skull, photograph it and send those pictures in to our submissions address with a little something about what it is really and maybe a little about you. 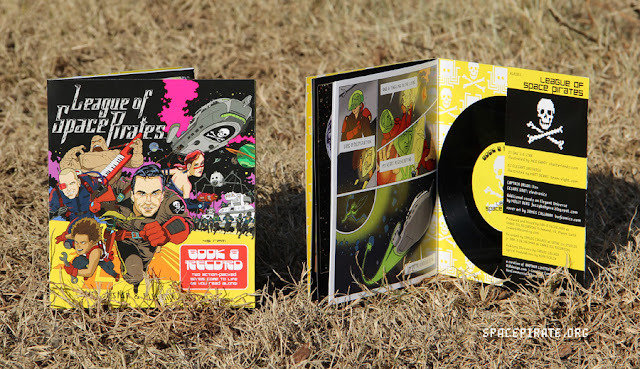 We have a new vinyl record coming out in March with an accompanying comic book! It can be pre-ordered now HERE. And we're playing a show on February 17th at Gallery 5 in Richmond, VA. More details HERE. Become a friend of League of Space Pirates on Facebook to keep up with the latest news! 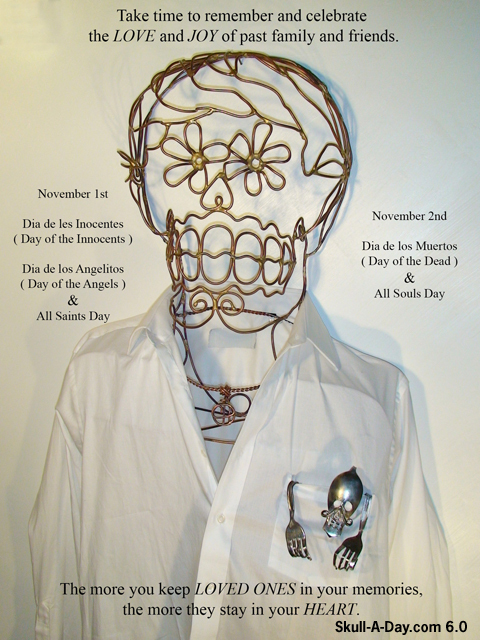 Today, Teresa Reaver presents us with, "A sculpture piece I completed in Mexico for De La Los Muertos this year." It appears to me to be a combination of steampunk and stone. Teresa's work is wonderful in many ways. She uses a lot of different elements in her work (stone, metal, glass, wood) and the details are astounding. Check out this thoughtful skeleton if you want to see more. Thanks for sharing your work, Teresa! These pieces are very striking to me, I love the concept of using correction fluid on a black background. It cause these pieces to have such a glow to them. Thank you for sharing your work with us as well as the link to more of your art. You have an amazing style that I could admire for hours. 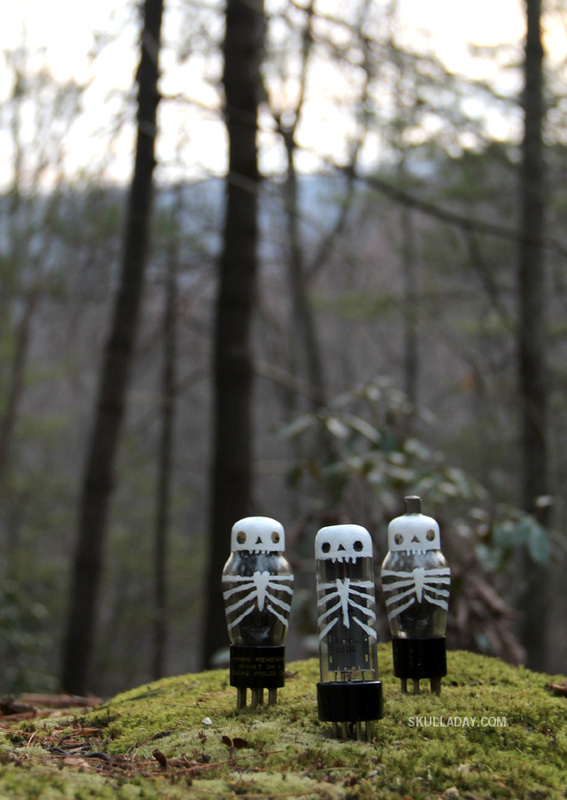 Want to have your own Skeletube adventures? You can get one HERE. This contest has ended. Thanks to all of you who entered and good luck in our future giveaways! Don't forget that you only have until 11:59:59 Eastern Time on TONIGHT to get entered to win a FREE personalized etched glass from Tatman Glass. This glass features the #149 Cocoa Skull Stencil and will also have the winner's name etched on the back using Skullphabet #1. Don't worry if you don't win, you can always feel like a winner with your own Official Skull-A-Day pint glass done by yours truly, Tatman Glass. Good Luck! Nadia Gunwaldsen created this artwork, titled "Jingle Bells". 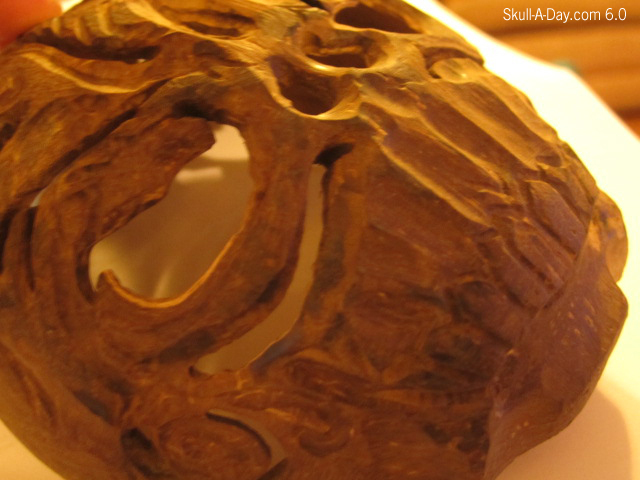 According to her Etsy shop, her pieces are created by carving into wet joint compound that is applied to a board. Then, she paints the images and glazes them. 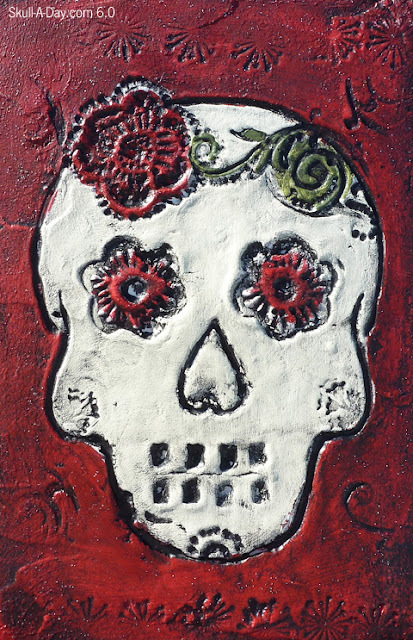 I come across a lot of Dia de los Muertos inspired artwork. It's rare that there is one that I love and even more rare for it to be textured like Nadia's is. I love her unusual use of materials mixed with a favorite motif. The texture reminds me of plaster paintings and embossed metal. This piece has a nice balance of beauty in both touch and sight. If you like this piece, check out Nadia's Etsy shop for more original and printed pieces. Don't forget that you only have until 11:59:59 Eastern Time on Friday, January 25th to get entered to win a FREE personalized etched glass from Tatman Glass. 36 of the paintings from my 100 Painted Skulls project will be on display here in Richmond, Virginia for the month of February at Book, Bikes, and Beyond Thrift a very cool local store. If you're in the area I hope you'll come out for the opening reception on Friday, February 1 @ 7pm. I totally dig these bold designs with such bright colors. Dark and mysterious skulls have their place as well, but sometimes we have to remember to laugh at life, and that first skull just strikes me as comical. Plus, I love Shaun's use of the all seeing eye(I'll let you figure out why). Thanks for sharing the sweet designs, Shaun! That's right, ladies and gentlemen(and non-gentlemen)! It's been such a great pleasure to host all of these magnificent giveaways from all of our wonderful sponsors that I had to reward myself with the awesome feeling of giving a prize away as well. 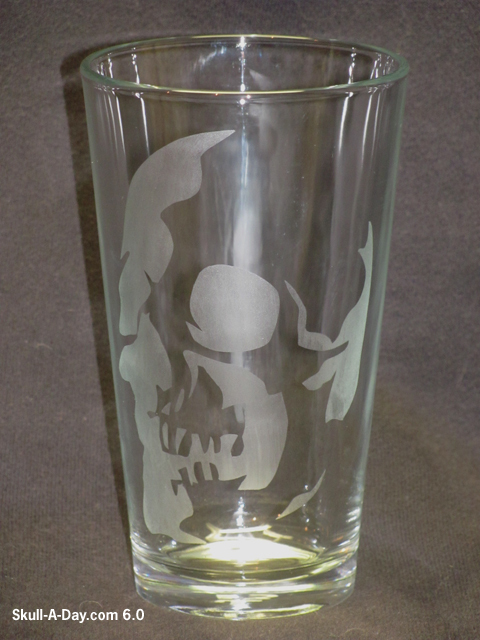 So, here I am with my specialty- a Skull-A-Day etched pint glass. I cut all of the stencils for my glasses by hand on each glass so that no 2 glasses are truly the same. 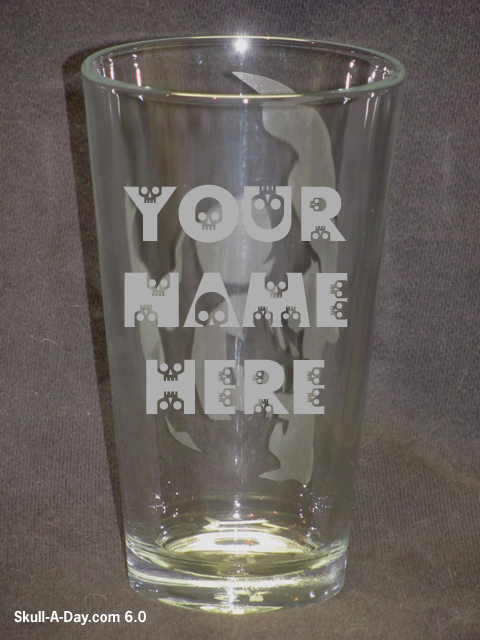 The glass you see featured below has Noah's #149 Cocoa Skull Stencil on the front, and it will truly be a one of a kind for one lucky reader who will be randomly selected to have their own name etched onto the back side using Skullphabet #1. PRIZE INFO: One (1) Personalized pint glass with #149 Cocoa Skull Stencil on the front and the winner's name in Skullphabet #1 on the back. HOW TO ENTER: I want to know one of two things. 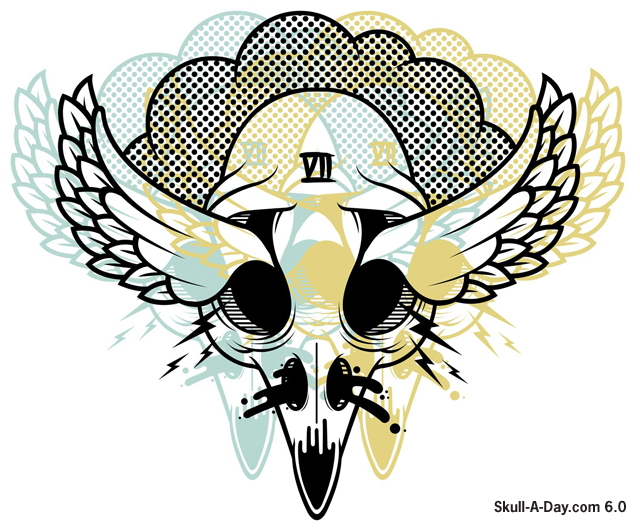 Either how long you've been a Skull-A-Day fan, or how you found out about our site. Whatever you choose. 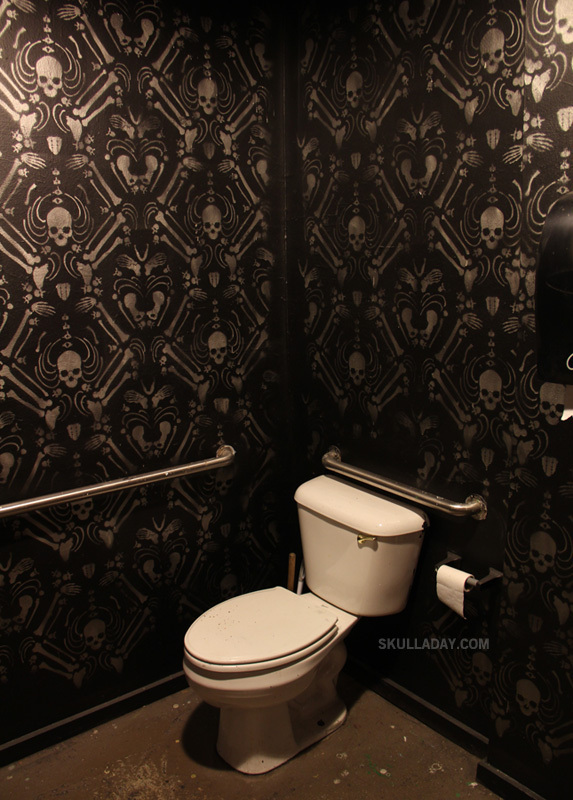 I've been here since the first month (maybe first week) in 2007 because I was looking for some skull cabinet knobs. True story. CONTACT INFO: If you win, we need to contact you. With your comment please include your email address. Entries are only valid with this information! You can break it up to avoid spammers(i.e. skulladayfan AT skulladay dot com). CONTEST CLOSES: 11:59:59 PM Eastern Time Friday, January 25th. PRIZE SHIPS: Apologies to our international fans, but this contest is only open to North American entries. Glasses are just too heavy and fragile to make the long trip. 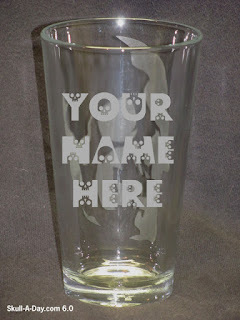 IF YOU DON'T WIN: You can always get your own Official Skull-A-Day pint glass at Tatman's Glass site. I'm still only offering the #9 Stencil Skull, but if I get more positive feedback I may start to offer any of the available stencils on our Free Stuff page. If you would be so kind then let me know what you think. Good luck!!! 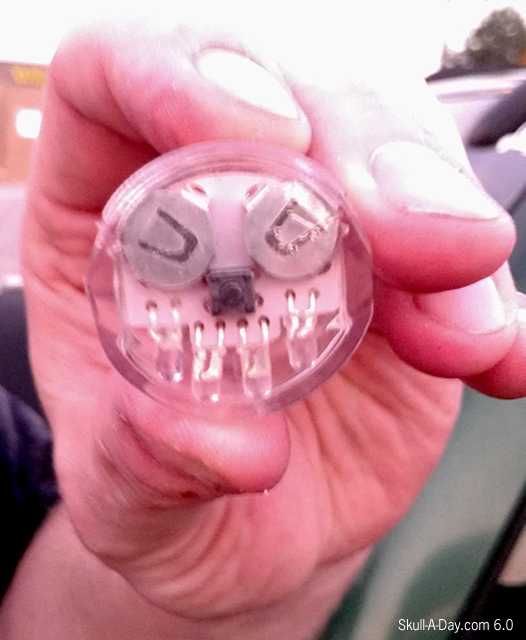 Carlton Kotalo pointed out the skull-iness of this this LED device we were using on the League of Space Pirates video shoot. Where is was being used, well that's my little secret. 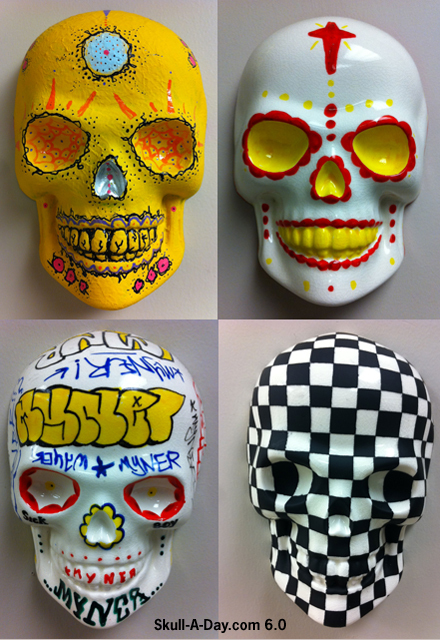 Ian Childers is a ceramics professor at Mississippi University for Women who has been making and painting these ceramic skulls for about 5 years. He's been following our site for a few years now and "professed" his love for our site and our skulls. 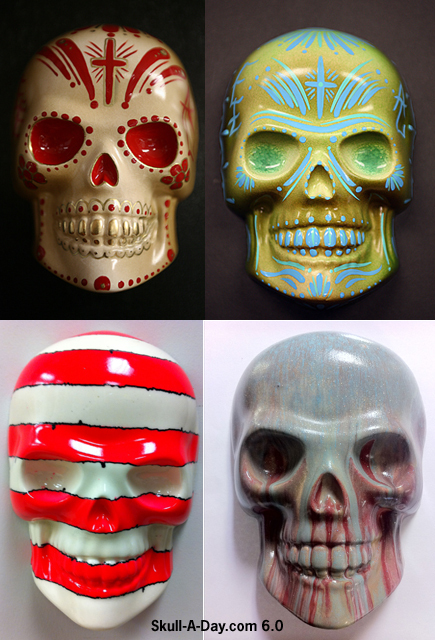 Different designs painted upon it make each skull unique, but the addition of making each ceramic skull goes further into solidifying their unique status. My personal favorite is the grey skull with the "blood"(?) running down it's face. I hope you find more and more students each year wanting to learn more from your skull art, Ian. Thanks for submitting your great collection! 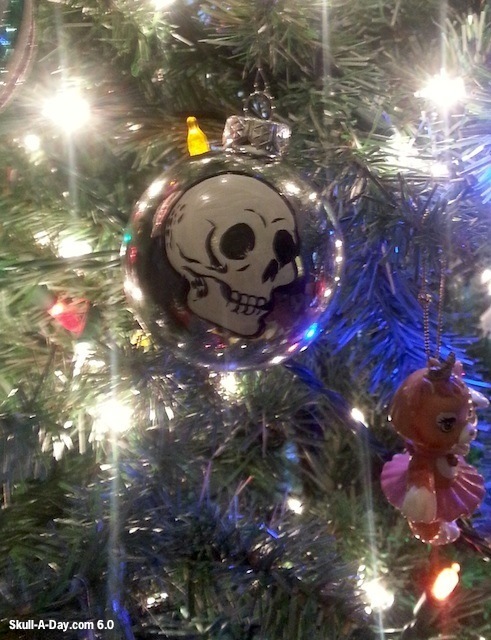 Past contributor Ronn Campbell in Kennewick, WA told us: "Here is a present I made for myself- Have a skully, skully Christmas." As the weather around here may keep me inside for a limited time maybe this is a good weekend to pack away some Yuletide. This piece however should be considered for a "nevergreen tree"- you know those artificial ones that just too big to store so you keep it up all year and just remove the specific Christmas theme ornaments so it doesn't look so weird. Thank you for sharing your lasted work with us we always appreciate seeing what our old friends are creating new. Melanie Church is "a librarian at Greenlease Library at Rockhurst University in Kansas City, MO. 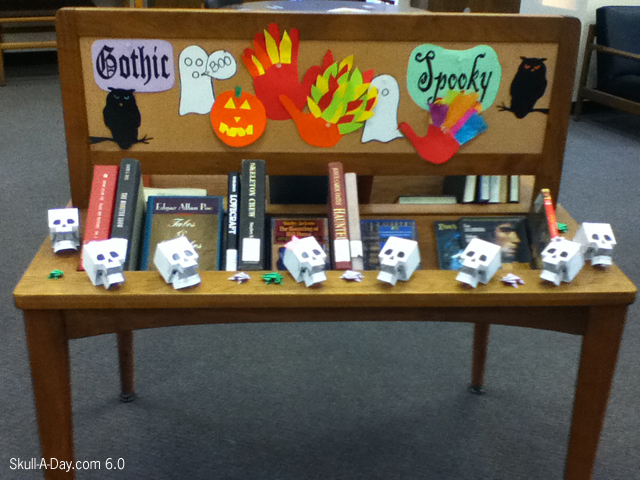 I found your papercraft skull online and thought it would be perfect for the spooky side of our fall book display. The student assistants who work at the circulation desk had a lot of fun making these. They were an even bigger hit than the hand-turkeys we made the week before." 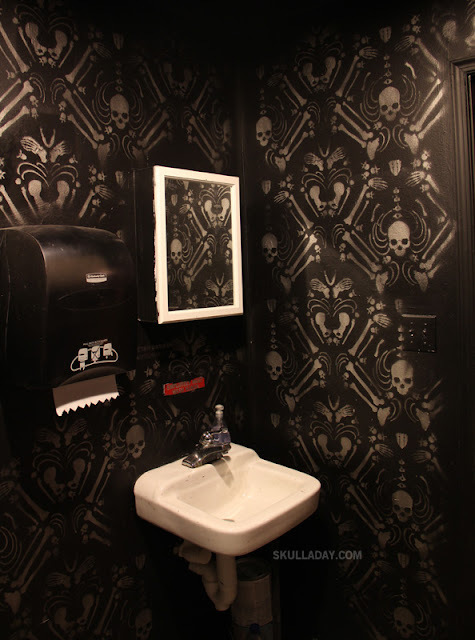 We love seeing the Papercraft Skull being used! This festive Autumn display of papercraft skulls, origami frogs, much approved scary books, and other seasonal artwork is great! I'm glad the student assistants enjoyed making them and the response was so good. If any of you has made anything using the Free Stuff on our blog, please submit it to us! We love seeing what you all create, and want to share it! Want to have your own Skeletube adventures? You can get one in the new Skeletubes Store HERE. Scott Middlehurst carved a coconut "into a skull using my Dremel tool and some diamond points". 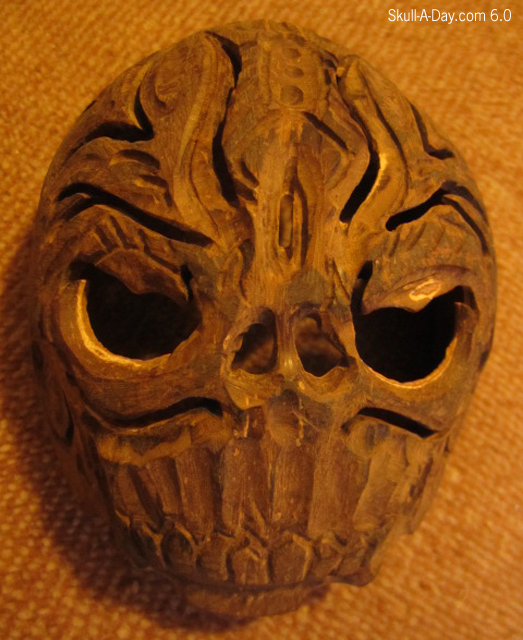 I love the rawness of this carved skull. That's probably from the wood grain of a coconut. That has to be a difficult and unpredictable wood to work with. 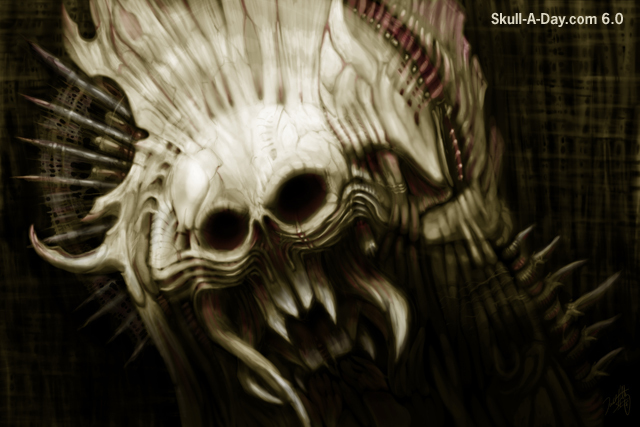 The skull reminds me of a tribal mask. It also reminds me of "what if" stories related to being stranded on a deserted island. Surely, I would need to do something creative while waiting for rescue. Perhaps it would be making a skull out of a coconut...though without a Dremel to help. 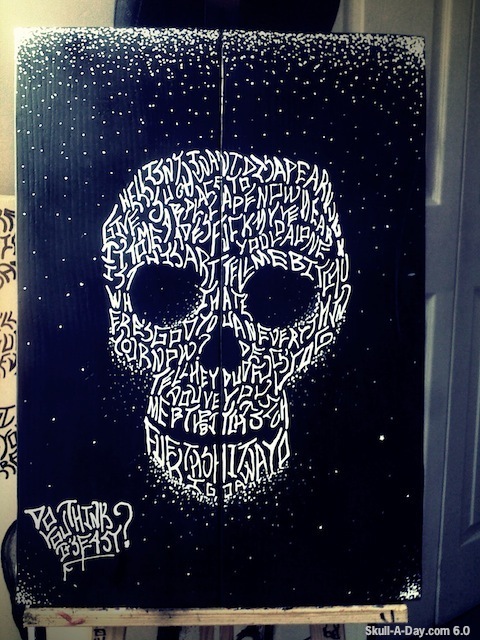 Artist Jaisen Yates who lives and works in Newcastle Upon Tyne in the UK sent us a piece of his work. He explained: "My Wabbi-igami sculpture is made from molded resin with a real skull set into the resin after drying using car body filler, which was then shaped and spray painted." Frank is that you? I am recognizing recently that I am a fan of assemblage art. It truly is an incredible feat you accomplished with this piece, it has the look of fired porcelain, but you have mastered that element of disguise. It also reminds me a little bit of an award statue, congratulationg on winning a "Wabbi" for best artistic use of car body filler. Thank you for sharing this piece with us. You should definitely check out the other pieces R!ch is making as part of this project on his blog HERE. Today's wire working comes form the mind of Clay Hoffman who was featured here back in 2011. 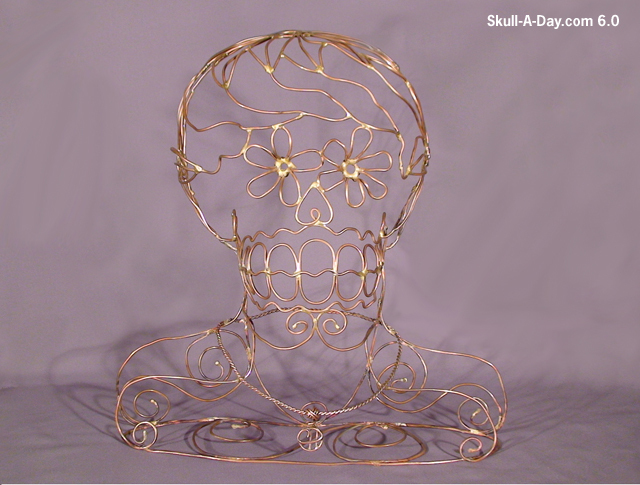 He's added some shoulders to this wire skull to create a skull "hanger" of sorts. ...for creating this "Day of The Dead" greeting card. 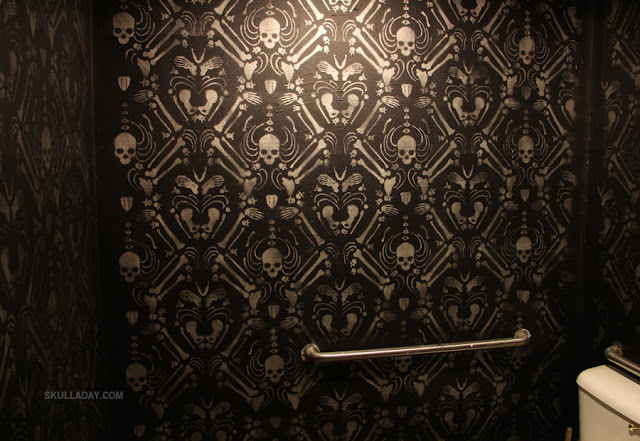 The skulls are wonderful, but the whole functionality of it takes it to a new level. The message is a great reminder to remember where we came from and those who helped to get us here. Let us never forget. Thanks again for the super submission, Clay!